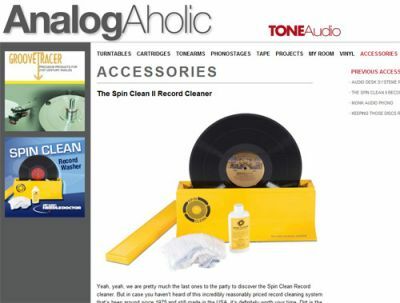 The folks at Tone Audio have kindly mentioned our product in a recent AnalogAholic accessories review and have keenly discovered some of the most compelling points of what the Spin-Clean Record Washer MKII has to offer, namely its simplicity (no vacuum hoses to loosen), its quietness (no motor) and, perhaps best of all, its effectiveness (removing dirt and deep-seated fingerprints). We appreciate the honest review. Thanks, Tone Audio!